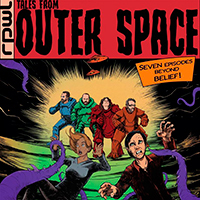 After 8 studio albums and 6 live albums, the German band RWPL will release their new studio album “Tales From Outer Space“ on 22 March 2019. The new album is not like the previous two albums “Wanted“ and “Beyond Man In Time“ a concept album in the true sense. But there are seven short stories about science fiction. So it is more an album with a theme. “Tales From Outer Space“ will be released on their own Gentle Art Of Music label on several formats. Vinyl (4 different colours), CD digipak and a limited box edition with extras like a comic book and signed cards. There are many stories about visits from extraterrestrials. Sometimes the aliens come as friends, sometimes they come to enslave us. But in “A New World“ the first song of the new album they immediately leave again, completely shocked. Shocked about how much suffering and evil is caused by humans on earth. Another song is called “Not Our Place To Be“. Interesting and confronting point of view. You can find seven songs on this fine album which I would qualify as one of the best RPWL studio albums. Musically wise the music could be categorized as a mix of Art Rock and Progressive Rock. The band experimented with new sounds but the overall sound is typical RPWL. RPWL tracks are always song oriented and full of nice melodies. And with producer and second keyboardist Yogi Lang the band has also a top notch singer. Because of the slight resemblance with the voice of David Gilmour and the wonderful lyrical guitar playing of co-producer Kalle Wallner the band will always have a connection with the music of Pink Floyd. Last year at the Crosslands Festival in Ulft, The Netherlands the band impressed me with a flawless performance of several Pink Floyd epics from the “Wish You Were Here“ album. This said I would underline the fact that RPWL has over the years developed their own sound and particularly on this album RPWL sounds as RPWL. Especially the driving forces behind RPWL are shining on this album. Of course I am talking about Yogi Lang and Kalle Wallner. Yogi Lang shines in the beautiful last song “Far Away From Home“. A slow song with beautiful vocal lines. And in two other personal favorites Kalle Wallner distinguishes himself. This are the two longest tracks of the album, “Light Of The World“ (10:08) and “Give Birth To The Sun“ (8:58). Love those melodic and soaring guitar solo’s. I would also mention keyboardist Markus Jehle. Just listen to the beautiful keyboard orchestrations and new sounds in those two earlier mentioned long tracks “Light Of The World“ and “Give Birth To The Sun“. “Tales From Outer Space“ is in my opinion one of the best studio albums that RPWL has made so far. This well produced album sounds fantastic. An album full of beautiful melodies and extraordinary guitar work and great vocal performances. Only for my three personal favorites I would buy this album. But it is an album with a consistent quality level. For all the RPWL fans out there ... it is a must buy. Looking forward to hear the new songs in a live setting.